Apart from its “anti-corruption war”, another “war” this government is fighting is that of hate speech and fake news. But it seems the ruling All Progressives Congress (APC) chooses only to fight these wars when the subject of its crusade is running against its wishes. 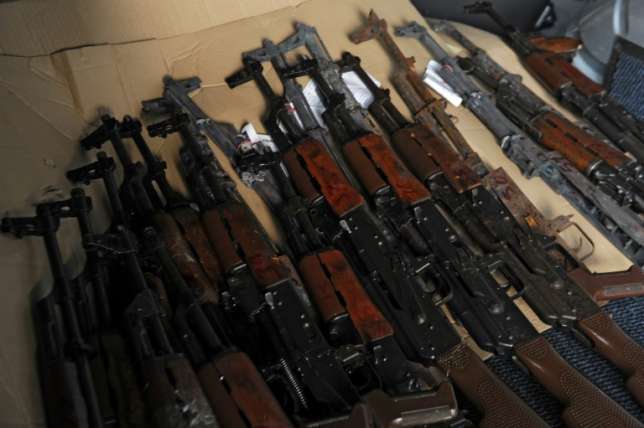 Recently it was reported that a Lagos bound ship loaded with weapons worth about $3.5 million was seized in South Africa. The news has received various reactions from different persons in the country as to the risk associated with having such a large cache of weapons in the country this close to elections. RELATED: Adeleke University has been threatened with demolition, is there a problem? A discovery of this magnitude threatens to dismantle the country’s fragile peace and must be strongly condemned by all the relevant parties in the country. However, the APC’s recent comment, to say the least, is childish and unpatriotic. According to its spokesman Yekini Nabena, the party accused opposition parties of being behind the influx of weapons saying they are trying to gain power through illegal and unconstitutional means. No security agency has confirmed the APC’s assertion and this statement can be described as inciteful. This kind of fake news is the very thing the APC-led government has sworn to fight against. The country currently has more than seventy opposition parties in the country, accusing them indirectly of importing the weapons is the kind of politics we need the ruling party to stay away from. The APC since 2015 has perfected the art of blaming the opposition for its woes and its glaring incompetencies which shows how inadequately the party prepared for power. This latest attempt by the party to shift its inadequacies to opposition parties is unnecessary. Nigeria is more important than party politics.